Communicating about research used to be something left to journalists, but not anymore. The need for the scientist to start communicating their research with the outside world is here and CIHR and other organizations are leading the charge to motivate scientists to be better at sharing what they do and what they find with the public. I recently was awarded a grant from the Canadian Institutes for Health Research (CIHR), the leading funder of health research in Canada. This was one of those hard fought, peer-reviewed grants that provide the fuel for the engine of research (and look good on a CV to boot). 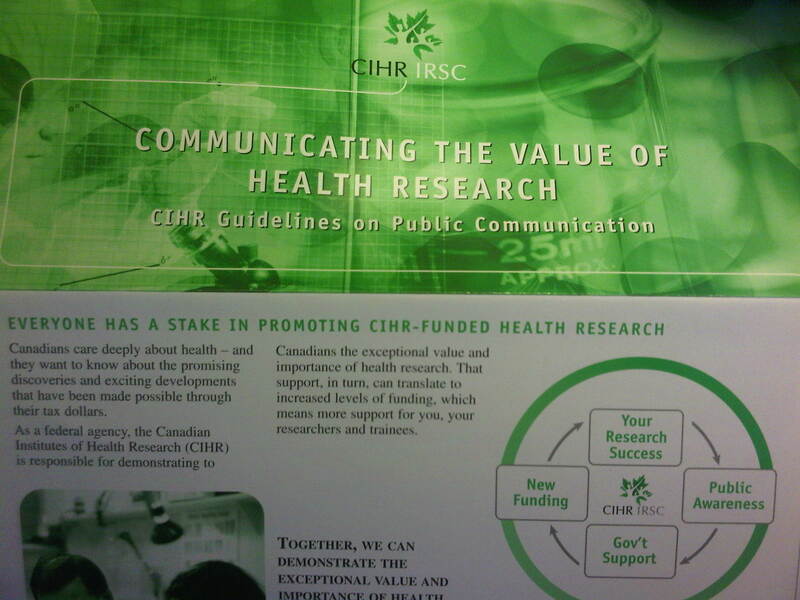 I’ve been fortunate to have had funding from them before, but unlike the other times I’ve received a letter from them (or another funder) this time I received something extra: a pamphlet called “Communicating the Value of Health Research” . The pamphlet provides a short outline of how as scientists we can better share what we do with not just the usual places (peer-review journals, academic presentations), but also the wider world. It fell short of advocating for science blogging, or posting results on Twitter, but went beyond the usual to discuss ways in which scientists can better explain what they do the public and why that is a good idea in the first place. In any other venue this might not be so strange, but for CIHR — or rather, academic health research more generally — this was something of a surprise. One of the biggest problems we face as researchers is that there is an air of mystery about what we do to the public and frankly, I think most researchers are content with that. Much of what we do is unknown to the rest of the world for very good reason: we are the one’s who invented the very thing we are studying. This is pretty handy when that invention is something that has the potential to change people’s lives for the better, but much less so when that ‘thing’ is a new way of expressing something we’ve done over and over again or something that has no obvious benefit, but might a long way down the road. Sure, we like the attention that comes when people actually use our work for something, but the prevailing idea for most of the 20th century held that the work had its own merits and therefore should be valued by the public because of it. The dawn of the era of knowledge translation; active promotion of research and consideration for how it is presented, potentially used, and the role of the audience, participants and intended beneficiaries of research outputs is here. And CIHR is determined to ensure that we researchers promote what we do, hence the little pamphlet I received with my acceptance letter. The concept of the socially active researcher promoting his or her research without the filter of peer review is something that scares a lot of people. Those fears are not unfounded. There is a lot of research that is not well-grounded, potentially confusing, and overtly misleading, incomplete or inaccurate. Gunther Eysenbach has pointed to some of these glaring problems in his discussion of the concept of infodemiology. Yet, the idea of the researcher as a stand-alone generator of knowledge is outdated. It implies a system of knowledge generation that is divorced completely from its effects, which flies in the face of what we know about innovation and applied research. This is not to argue that there is no place for the “pure” scientist, focused exclusively on research, but that is only one role within a larger spectrum that ought to reflect a diversity of mixes of research and application. On the other end should be those who’s role is to exclusively translate knowledge into action, much like the Canadian Health Services Foundation’s concept of the knowledge broker (PDF). Regardless of the position taken in this spectrum, I believe that we researchers all need to take some responsibility of arguing for reasons to do research, communicating to the world about its value (and demonstrating this), and ensuring that its application and funding is done responsibility. Otherwise, we leave its fate to a public unaware and constantly bombarded by other messages touting the value of other activities, both beneficial and banal. It is because other groups have been so good at communicating their message that science and research has been so hard hit. Last year, the federal budget for research was cut. This year, the increase barely (if at all) kept pace with inflation. In both cases, the public outcry was non-existent. The reason, I believe, is that the public has little idea about what science means for them, why it is worth investing in, and what it would mean if it disappeared. It’s also because we researchers, programmers, and policy makers have done (collectively) a lousy job of translating what we know into what we do. As a researcher, I need to take responsibility for the part of the equation that falls within my sphere of influence and that means communication. My message to my scientific colleagues is this: if research and its value is important to you, read the pamphlet and take action. Communication is the future of our profession. Congrats on your CIHR grant! I think what you are (in part) referring to is “integrated KT”. Two publications, “Knowledge Translation Casebook” (http://www.cihr-irsc.gc.ca/e/documents/kt_casebook_e.pdf ) and/or the Guide to Researcher and Knowledge-User Collaboration in Health Research (http://www.learning.cihr-irsc.gc.ca/) are available to learn more about this. But your point about using technology to help disseminate is well taken. Both of these documents make reference to this only in passing. This recent presentation by the Ontario Knowledge Translation Community of Practice, KTE 2.0: What’s the Point of 2.0? (http://www.ktecop.ca/presentations/kte-20-whats-the-point-of-20) provided some very practical and hands on ways to disseminate research results by leveraging the collaborative elements of the web. As for directing research findings towards the public I agree with Richard Smith’s recent BMJ blog on peer review (http://blogs.bmj.com/bmj/2010/03/22/richard-smith-scrap-peer-review-and-beware-of-%E2%80%9Ctop-journals%E2%80%9D/) where he states, “Instead, let people publish and let the world decide”. Thanks for your note of congratulations and the references. I missed hearing Ian Graham’s talk on integrated KT and am glad that you brought it up (particularly so other readers have access to it). The concept of KT has certainly evolved and the ideas of making KT part of the question as well as a manner of addressing the answer is a positive step forward. I think Richard Smith’s idea of letting the people decide is a great one, but certainly something that is ripe for debate, discussion and research!